AIM Peak Endurance� provides the only oral source of ATP clinically proven to elevate ATP levels within the body. Peak Endurance is a blueberry/Acai energy drink mix combining ATP (adenosine triphosphate), electrolytes, B vitamins, vitamin C, and phosphorus, and it contains only one gram of sugar per serving. 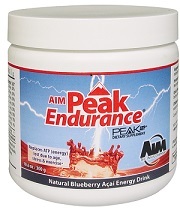 Each scoop of AIM Peak Endurance� contains 125 mg of adenosine 5-triphosphate disodium, or Peak ATP�. Suggested use: Take twice daily, once in the morning and in the afternoon on an empty stomach. Re-Hydration (Hypotonic): Mix one scoop (8.33 g) with 10 to 20 ounces of water. Best taken during and after exercise. Hypotonic beverages contain a concentration of sugars and salts lower than those in the body. This concentration ensures water is taken up by the body, rapidly aiding in rehydration after exercise. A well-diluted juice, 80 percent water and 20 percent juice, is a good example of a hypotonic drink. Rapid Absorption (Isotonic): Mix one scoop (8.33 g) with � cup (4 oz.) of water. Best taken before and during exercise. Isotonic beverages contain a concentration of sugars and salts equal to that of the body. This concentration ensures that nutrients or electrolytes are absorbed rapidly into the body and are best taken before and during exercise. A diluted juice, 50 percent water and 50 percent juice, and a pinch of salt is a good example of an isotonic drink. No matter how a juice is diluted for absorption, it cannot provide the electrolyte, vitamin, and ATP benefits of AIM Peak Endurance�. Close tightly after opening and store in cool, dry, dark place (70-75 F; 20.1-23.8 C). Do not refrigerate. If pregnant or nursing, please consult a health practitioner. Not recommended for children under age 8. Children ages 8 (60 lbs.) to 16, mix two teaspoons (6 g) with 8 to 16 ounces of water once a day.